James Benedict Brown was born and raised in East Anglia. He went to ... James graduated with his Masters in Architecture in 2008, his thesis design project proposing a museum and research facility of international frontiers built within the historic fortifications of the English/Scottish border town of Berwick-upon-Tweed. James Benedict Brown, De Montfort University, Leicester School of Architecture, Faculty Member. Studies Architectural Education, Architecture, and Education. Dr. James Benedict Brown is Senior Lecturer (VC2020) in Architecture at the Leicester School. Dr James Benedict Brown is Lecturer in Architecture at the Leicester School of Architecture. He was awarded a PhD at Queen's University Belfast in 2012 for a pedagogical critique of the live project in architectural education, which was shortlisted for the 2013 RIBA President's Award for Outstanding PhD Thesis. Experiential Learning: A Best Practice Handbookfor Educators and Trainers, 2nd edn. London: Kogan Page. Brown,J. B. (2012). 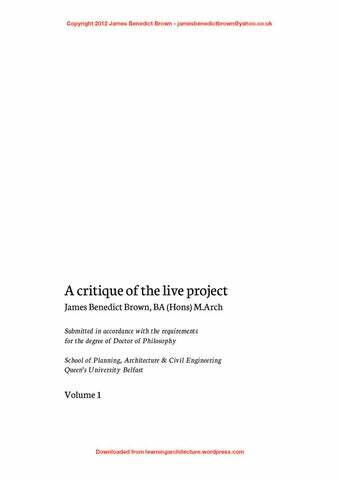 'A Critique of the Live Project', PhD thesis, Queen's University Belfast. Brown, J. B. (in press). ' “An output ofvalue” – Exploring the Role of the Live Project as a Pedagogical Bureau de Change'.